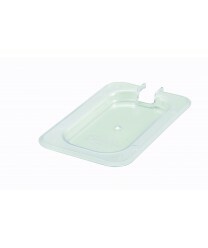 Made of durable, break-resistant material, the Winco SP7900C Poly-Ware Slotted Food Pan Cover, 1/9 Size will be a great addition to your kitchenware collection. This sturdy ninth-size food pan cover will help keep airborne food contaminants at bay, preserving the overall quality of your food. The polycarbonate food pan cover can tolerate a range of cold and hot temperatures, and it has a notched design, so you can keep a mixing or serving utensil close at hand. Because the cover is transparent, your staff or self-serve customers will always have a clear view of pan contents.